Halve beans if they are large, place in a slow cooker with water to barely cover and add onion and ham hocks. Cover and cook on High until simmering. Reduce heat to Low and cook for 2 to 3 hours or until beans are crisp but not done. Add potatoes and cook for another 45 minutes. 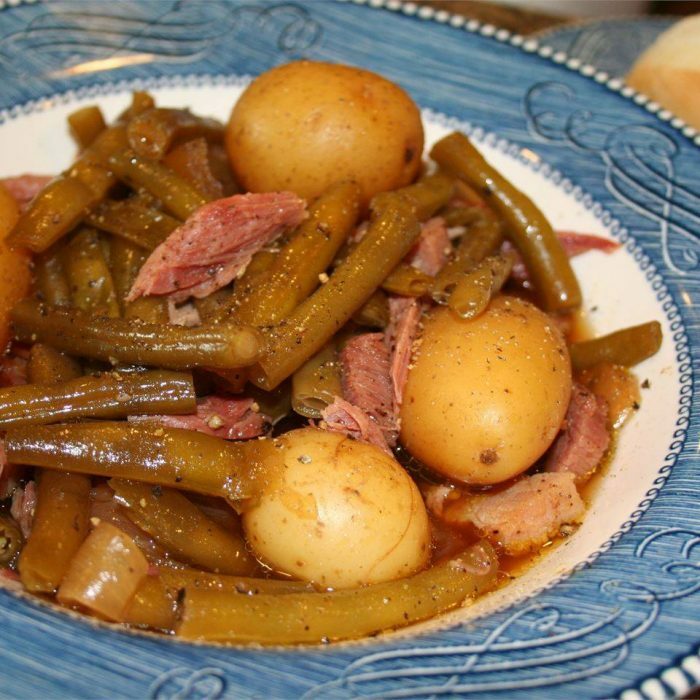 While potatoes are cooking, remove ham hocks from slow cooker and remove meat from bones. Chop or shred meat and return to slow cooker. Season with garlic powder, onion powder, seasoning salt, bouillon, and pepper. Cook until potatoes are done, then adjust seasoning to taste. To serve, use a slotted spoon to put beans, potatoes, and ham into a serving dish with a little broth.